I am not going to go into a great deal of detail here, for three reasons. One is that photographic equipment that is state of the art today will be obsolete before the end of the year, products are changing that rapidly. The second reason is that I am not the technophile that I used to be, I don’t even try to stay current with what’s on the market, and I know what I want in camera equipment, so I don’t do much shopping. The third reason is that there are tons of resources out there for comparison shoppers to pour over if that is what they want to do, but I find that getting caught up in specifications doesn’t add to photography in any way. I am going to start with my recommendation, then if you want to read the rest of this, it is up to you. For most people just getting into nature photography, I would recommend a compact digital, referred to below as a bridge camera, one that will zoom to at least 30X, more if you can. Why a compact digital? Because they are small, light, easy to carry, and easy to use. Buy a high quality compact digital and learn lighting and composition, and ease your way into the technical aspects of photography on your own pace. Many people who start out with a Digital Single Lens Reflex (DSLR) camera become frustrated trying to learn how to use their new camera, and give up trying. A DSLR and full set of lenses needed for nature photography is a costly investment, and weighs a considerable amount as well. No camera works well if you leave it at home because it is too heavy and cumbersome to take with you outdoors. A compact digital will fit in your pocket, and there’s no excuse for not having it with you. Some day down the road if you do decide to purchase a DSLR, you may well find that you still carry the compact digital, especially if you are a hiker, backpacker, or kayaker. I have both a DSLR and a compact digital, and I always carry the compact digital with me, on long hikes or while kayaking, the DSLR stays home. So start with a good compact digital, I don’t think you will be sorry if you do. Generally, cameras are categorized by the size of the image they capture, either on film or digitally. The four size categories are compact, 35mm, medium format, and large format. Medium format cameras are larger than 35mm and range up to 4 X 5 inches if I remember correctly, and large format cameras are those that capture an image larger than 4 X 5 on up to some special cameras that fill entire rooms. I am not going to explain them here, there are few beginners who are going to go out and purchase a medium or large format camera as their first camera. They are the tools of the pros, and too heavy and expensive for the average amateur who will be reading this. I recently saw an ad for a Hasselblad medium format camera that retails for $43,995.00 without a lens. So that leaves us with two sizes for the amateur starting out. These are cameras that capture an image smaller than a 35 mm camera, and range from cheap pocket cameras that are only good for snapshots to some very elaborate cameras that are in essence, miniature 35mm cameras, that are sometimes called bridge cameras. Some “bridge” cameras are higher-end compact digital cameras that physically and ergonomically resemble DSLRs and share with them some advanced features, but share with compacts the use of a fixed lens and a small sensor. Like compacts, most use live preview to frame the image. Their autofocus uses the same contrast-detect mechanism, but many bridge cameras have a manual focus mode, in some cases using a separate focus ring, for greater control. They originally “bridged” the gap between affordable point-and-shoot cameras and the then unaffordable earlier digital SLRs. Due to the combination of big physical size but a small sensor, many of these cameras have very highly specified lenses with large zoom range and fast aperture, partially compensating for the inability to change lenses. On some, the lens qualifies as superzoom. To compensate for the lesser sensitivity of their small sensors, these cameras almost always include an image stabilization system to enable longer handheld exposures. These cameras are sometimes marketed as and confused with digital SLR cameras since the appearance is similar. Bridge cameras lack the reflex viewing system of DSLRs, are usually fitted with fixed (non-interchangeable) lenses . The scene is composed by viewing either the liquid crystal display or the electronic viewfinder (EVF). Most have a longer shutter lag than a true DSLR, but they are capable of good image quality (with sufficient light) while being more compact and lighter than DSLRs. High-end models of this type have comparable resolutions to low and mid-range DSLRs. The majority have a built-in flash similar to those found in DSLRs. In bright sun, the quality difference between a good compact camera and a digital SLR is minimal but bridgecams are more portable, cost less and have a similar zoom ability to DSLR. Thus a Bridge camera may better suit outdoor daytime activities, except when seeking professional-quality photos. In low light conditions and/or at ISO equivalents above 800, most bridge cameras (or megazooms) lack in image quality when compared to even entry-level DSLRs. However, they do have one major advantage, often not appreciated:- their much larger depth of field due to the small sensor as compared to a DSLR, allowing larger apertures with shorter exposure times. Digital single-lens reflex cameras (DSLRs) are digital cameras based on film single-lens reflex cameras (SLRs). They take their name from their unique viewing system, in which a mirror reflects light from the lens through a separate optical viewfinder. In order to capture an image the mirror is flipped out of the way when the shutter release is pressed, allowing light to fall on the imager. Since no light reaches the imager during framing, autofocus is accomplished using specialized sensors in the mirror box itself. These cameras have much larger sensors than the compact digital cameras, typically 18 mm to 36 mm on the diagonal (crop factor 2, 1.6, or 1). This gives them superior low-light performance, less depth of field at a given aperture, and a larger size. They make use of interchangeable lenses; each major DSLR manufacturer also sells a line of lenses specifically intended to be used on their cameras. This allows the user to select a lens designed for the application at hand: wide-angle, telephoto, low-light, etc. So each lens does not require its own shutter, DSLRs use a focal-plane shutter in front of the imager, behind the mirror. The mirror flipping out of the way at the moment of exposure makes a distinctive “clack” sound. So which type of camera is best for you? I’ll get to that after lenses, since all cameras have to have at least one lens in order to function. You’ll need to know something about the different types of lenses to know what camera is best for you. You may want to read the page on the basics of photography if you haven’t already, or if you want a refresher, particularly about aperture and depth of field, as lenses control both. A camera lens is a set of glass lens elements arranged to capture and focus light onto the sensor or film in a camera. It sounds simple enough, but it is the most complicated part of a camera. Each individual lens inside the camera lens assembly bends light in a different way, depending on what the lens is designed to do. We are lucky today, advances in glass making have led to far better glass for the lens makers to start from. Computer controlled lens grinding machines have made lenses far superior to the best that even the most skilled craftsmen could produce just a few short years ago, and the technology of lens coating has also made dramatic leaps in the last few decades. Some lenses are designed to magnify distant objects so that they appear to be closer to the camera than they really are, these are known as telephoto lenses. Some lenses are designed to increase how much of a scene the camera can record, think panorama, but they make distant objects appear to be even farther away from the camera than they really are, these are known as wide-angle lenses. In between is what is considered to be a “normal” lens, that is a lens that “sees” about the same as the human eye, and objects appear to be about the same size as our eyes see them. Then there are other specialty lenses, such as macro lenses that magnify objects very close to the camera lens to sizes larger than life-size. Then there are zoom lenses that allow you to vary what is known as the focal length of the lens. This is where we get into a few technical phrases, but I am going to try to keep this simple. The focal length of a lens is the distance between the film and the optical center of the lens when the lens is focused on infinity. I know, that means nothing to you. It’s better if I describe the effect of the focal length of a lens. The longer the focal length, the more the lens will draw distant objects nearer, like a telescope does. In 35 mm photography, a lens with a 50 mm focal length is considered normal. The camera with a 50 mm lens will see what your eye sees. A lens with a 500 mm focal length will bring distant objects much closer, as if you were looking at them through a 10 power telescope. Let’s say you’re walking through the woods and see a deer standing 100 feet from you. If you use a 50 mm lens, the deer will appear just as it does in real life, as if it is 100 feet from you. If you were to use a 500 mm lens on a 35 mm camera, the deer would look like it was only 10 feet from you. If you were to switch to a 25 mm lens, the deer would appear to be 200 feet from you. In 35 mm photography, any lens with a focal length longer than 55 mm is considered to be a telephoto lenses, and lenses with a focal length of less than 50 mm are considered to be wide-angle lenses. A couple more terms I need to explain, wide-angle and angle of view. Think of walking in a tunnel, you can see very little of the world beyond the tunnel as you are walking through it. With each step, you can see a little more of what lies beyond the end of the tunnel, until you get near the end, and then it is as if the world opens up, and you can see all around you again. Using a telephoto lens is like starting into the tunnel, things at the other end seem closer, but all that you can see are things directly in the tunnel’s opening. With a wide-angle lens, it is like being very close to the end of the tunnel, your angle of view is much larger, and you can see more of what lies beyond the tunnel. Both types of lenses, telephoto and wide-angle, change the perspective of what you see in a photo compared to reality. A telephoto lens compresses the distance between objects in the foreground, and objects in the background. A wide-angle lens expands the distance between objects in the foreground and those in the background. However, when it comes to depth of field, each lens has the opposite effect, telephoto lenses shorten the depth of field, wide-angle lenses lengthen the depth of field. I know, this is becoming confusing, sorry, that’s photography for you. Maybe this will help. Use a telephoto lens when you want to convey a sense of intimacy with the subject you are photographing. A telephoto lens brings the subject closer, and isolates it from the background. Professional portrait photographers almost always use a short telephoto lens of between 90 mm and 150 mm when they work for that reason. There’s another reason too, a short telephoto lens is more flattering to the human face as well. On the other hand, a wide-angle lens helps to convey a sense of space and distance, and is most often used for landscape photography. Think back to the deer in the woods I used earlier. To get close to the deer, use a telephoto lens. But if there is a waterfall not far from the deer, but you can’t get it in the frame of a normal lens, use a wide-angle lens. With zoom lenses, you can vary the focal length of the lens, either by hand or a motorized control. 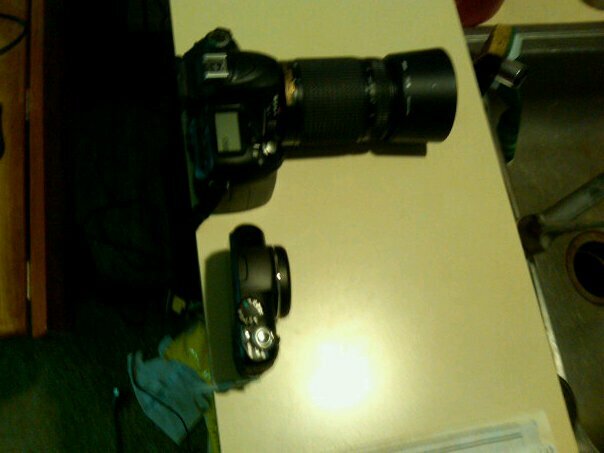 For example, the lens I have for my Nikon is a 70-300 mm zoom. There are many different zoom lenses available for most DSLR cameras with different zoom ranges, from wide-angle only, to from wide-angle to short telephoto, to short telephoto to medium telephoto. Macro lenses allow you to shoot photographs from very close to your subject, sometimes less than an inch away. They are specialty lenses typically used for extreme close-ups of flowers, insects, and other smaller subjects. When you shop for lenses, you’ll see them listed by the manufacturer, the model number, then the focal length, then the maximum aperture they are capable of. For instance, you may see a lens such as a “Nikkor ED 50 mm 1.2 lens“. That means it is a 50 mm focal length lens and that F 1.2 is the maximum aperture the lens is capable of. A zoom lens would be listed this way, a “Nikkor ED 70-300mm 1.4-5.6” to tell you it is a zoom lens that can vary the focal length from 70 mm to 300 mm, and the maximum aperture at 70 mm is F 1.4, and F 5.6 at 300 mm. Now then, as far as recommendations for nature photography, what lenses do you need? That depends on the camera you choose. I know, I have gone circular here, saying I would recommend a camera after the discussion of lenses. I have three cameras currently, an old Pentax Spotmatic II film camera, a Canon Powershot SX 130, and a Nikon DSLR D 50. I am going to buck the current trend here, which is to recommend that everyone purchase a DSLR, and tell you not to purchase a DSLR as your first camera, and here’s why. For nearly every one who reads this that doesn’t already own a camera, a very good compact digital camera makes the most sense for so many reasons. One, they are far more affordable than a DSLR and the full complement of lenses a DSLR requires to match the capabilities of a good compact digital. Two, they are much lighter and easier to carry. And three, they almost match the performance of a DSLR once you learn their limitations and how to work around them. One thing before I forget, pay no attention to the Megapixel rating on any cameras. Any camera made in the last couple of years has enough Megapixels, more than enough. When digital cameras first hit the market, the number of Megapixels was an important factor, but now that number is just a marketing ploy. The final resolution of your photos is no longer determined by the number of Megapixels the sensor has, but by the optics (lenses), software, and other factors. Getting back to my recommendations, and why I recommend a compact digital over a DSLR. Unless you plan on producing prints larger than 11 X 14 inches, the image quality of a compact digital is more than high enough to produce excellent quality prints. Most people don’t print many images these days anyway, most of us share our photos electronically and I doubt if any one will ever notice that the images from a compact digital came from one of them rather than a DSLR. If your goal is nature photography, and I assume it is since that’s what this is about, then having a small, easy to carry, easy to use camera makes more sense. Having your camera with you and ready to use when you are outdoors is the most important thing when it comes to nature photography. Here’s a picture of my Canon Powershot next to my Nikon D 50. Sorry about the quality, it was taken with my cell phone camera. But you can see the smaller Canon on the bottom is much smaller than the Nikon with a 70mm-300mm lens. My Canon goes everywhere with me, it does fit in a pocket in bad weather, and in good weather, I often clip it to the chest strap of my pack and can shoot pictures without unclasping it from my pack. Even though it is much smaller, it will do everything the Nikon will do as far as what I need in a camera for nature photography, and more. Let me explain that by listing the lenses that you will need for nature photography. You’ll notice I didn’t include a normal lens of between 50mm and 55 mm. With my Pentax, the normal lens was the least used lens in my camera bag. I seldom if ever used it for anything other than snapshots of people, and then it was only if I didn’t have time to switch to the 135 mm short telephoto lens I had for it. As I noted earlier, a short telephoto is much better for portrait photography. My compact digital zooms all the way from a wide angle lens to a 48X telephoto lens. It also has a macro setting that lets me focus in on things less than an inch from the front of the lens. It is a complete set up in one package, no need to stop to change lenses, no need to carry a camera bag that weighs 20 pounds along with me while hiking. I do normally carry my DSLR with me as well, for one type of photos, action shots. I find I can track moving animals much easier in the viewfinder of my DSLR, it is much faster as far as being ready to shoot quickly, and there is very little shutter lag to it. There may be people who disagree with my recommendations, but I think starting with an easy to use camera and learning photography first is much easier than starting with a camera that requires a steep learning curve as far as learning how to use the camera before you learn photography. have been kinda tempted by the new micro 4/3 format for a hiking / everyday camera. reluctant to spend all that money though lol for a new system when i already have a compact. right now i take my dslr, but i tend to leave it on anything more than a car camping trip. mainly use my compact / waterproof for that. Thanks for the comment. The only thing harder than deciding on camera gear is lugging it around with you after you purchase it. HAHAHA, yeah I’ve been trying to avoid the gear syndrome (reading online, researching, purchasing) and instead figuring out how to get outside more and take pictures. Thanks, I don’t blame you for wanting to avoid the gear syndrome. I hope that you have a wonderful time in Yosemite!